First things first: Forget everything you’ve heard about Frank Ocean—his recent “coming out” as a bisexual, his seemingly contradictory friendship and collaborations with the notoriously hateful, homophobic and misogynistic Odd Future collective, or the fact that everyone from Justin Bieber and Kanye West to John Legend and Brandy wants to work with him—and focus on the fact that at 24 years old, on his first proper album, a strong argument can be made that a voice this fresh and a vision for remaking R&B this bold puts him in the ranks of D’Angelo, Prince, Stevie Wonder and Marvin Gaye. And no, that’s not hyperbole. Dropping out of the University of New Orleans and moving to L.A. after Katrina and W. devastated his home town, Ocean, born Christopher “Lonny” Breaux, was a stranger in a strange land just about every way you can name: Struggling in the land of plenty, acutely aware of America’s class warfare, posing the deepest existential questions, losing his religion, fighting with his record company and feeling like an outsider racially and, yes, sexually. 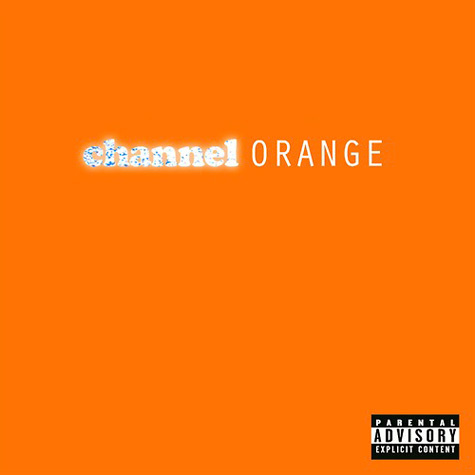 All of these topics and more can be found in the extraordinary set of songs at the heart of channel ORANGE, addressed in a voice that is at once incredibly charismatic and universally accessible to everyone; we all know someone this smart, sensitive and troubled, and we all want to give him or her a hug. Outside of a few bedroom artists more renowned in the indie hipster world, including Abel Tesfaye of the Weeknd and Michael Angelakos of Passion Pit, this is a rare and special approach in the R&B arena, where for far too long, from Bobby Brown through R. Kelly to Usher, the music has been dominated by sexist braggadocio, stilted musical confines, undue studio polish, a lack of soul and the incorporation of many of the worst clichés in hip-hop. 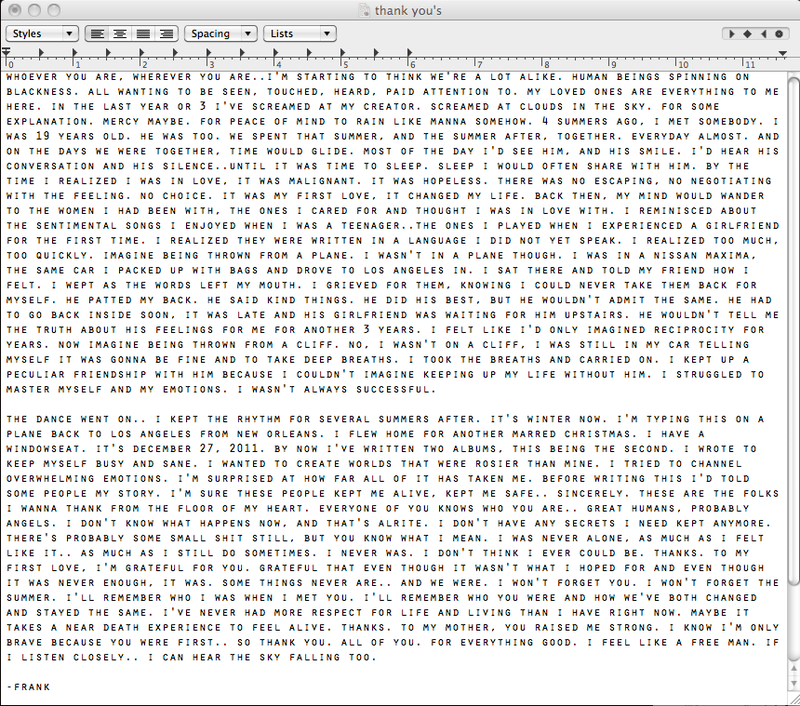 Ocean plays the game by a different set of rules, as radical in opening up his heart lyrically and his imagination musically as West has been in the rap game, but minus the monstrous egotism and the obsession with becoming a designer brand name (Ocean doesn’t even include a photo on his album cover). Over lush, gorgeous and gently pulsating grooves, he humanizes the self-destructive addict (“Crack Rock”), simultaneously mocks “Super Rich Kids” and sympathizes with lives of such affluent emptiness, pours his heart out to a Muslim cab driver who tries to offer solace to someone too ignorant or damaged to appreciate the lifeline (“Bad Religion”) and time and time again expresses unrequited love in terms guaranteed to move anyone who’s ever experienced it, with the added bonus of using the male pronoun so that no one is excluded. Like many of us, Ocean yearns for meaning; when he sings, “Why see the world/When you’ve got the beach?,” he’s not celebrating what he calls “The Sweet Life,” he’s searching for more: More purpose, more love, more substance in his life and ours. Criticizing such ambition, especially when it’s in large part so successfully realized, may seem unkind. But there is one glaring flaw that keeps the disc from being a masterpiece. Falling prey to the fondness of snippets of audio filler and brief throw-away non-tunes, a habit that had become annoying in hip-hop 15 years ago, the 12 songs are stretched out to 17 tracks, and the album’s flow suffers from these needless distractions.. This is perhaps less of a demerit that I indicated when we reviewed the disc on Sound Opinions last weekend, and I gave it a “burn it.” I’ll repeat that recommendation here but clarify it: Burn yourself a copy of this disc minus the extraneous stuff (or create a play list that does the same), but by all means, listen, listen, listen! Ocean’s is a voice that you need to hear.